I was recently invited to attend a blogger get together at Earthborn Pottery in Leeds, AL. A lot of fabulous Birmingham area bloggers were in attendance and I was really excited to meet everyone. Tena Payne is the owner of Earthborn Pottery. 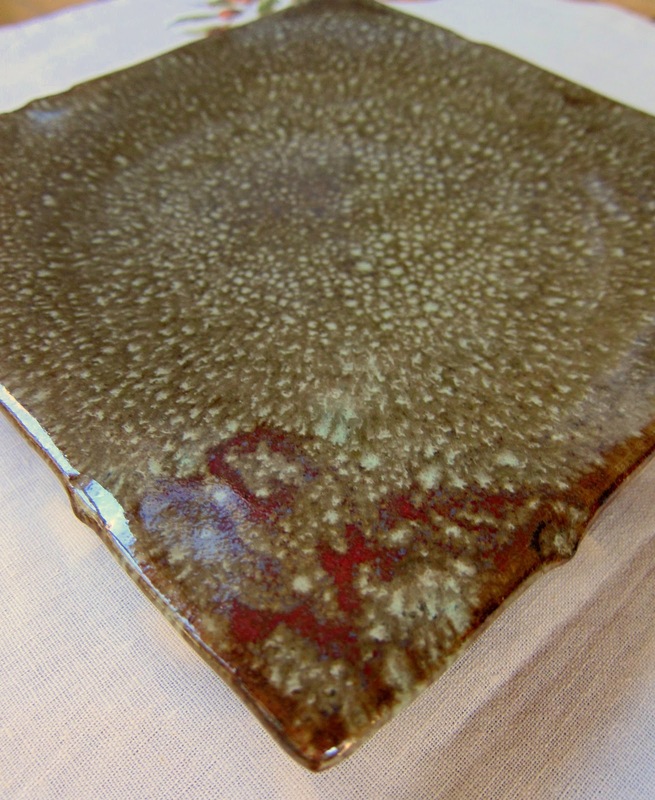 Her pottery is featured in many restaurants around the country and was even on the Iron Chef! We started the evening with a demonstration from studio owner, Tena, and her assistant, Nabeel. They made it look SO easy. It wasn't. I ended up having to have Nabeel help me make a bowl. He did most of the work but was nice enough to let me take credit! We also made some pinch bowls. We took balls of clay and pinched it until we had a bowl. We spent more time laughing than pinching - Jamie and Kat are hilarious! I am giving away one Earthborn platter! It is gorgeous! I love the pattern and the colors on it. The platter is about 12 inches square, and slopes slightly to the center. They are designed to hold olive oil for dipping. Want to win it? All you have to do is leave a comment on this post telling me if you have ever attempted making pottery and any tips you have for me! The giveaway is open until Wednesday, October 24th @ 11:59PM CDT. The giveaway is only open to USA residents. Be sure a valid email address is included with your comment. Winner will be chosen randomly and announced on this post. We will email the winner and if the winner doesn’t respond in 48 hours, a new winner will be chosen. Good luck! DISCLOSURE: I was invited to this event and didn't pay anything to attend. I received one piece of pottery to keep and one to give away. As always, all opinions are my own. Wow that sounds like fun! I've never made pottery before but like everything else practice makes perfect! Can't wait to see your finished piece. Thank you for the giveaway! I've never made pottery either but it sounds like it would be relaxing and productive. I would advice anyone trying for the first time to remember pottery is a piece of art, and imperfections are part of the beauty. When I was a teenager we made glazed and fired coffee mugs. My only advice is keep doing the fun stuff. 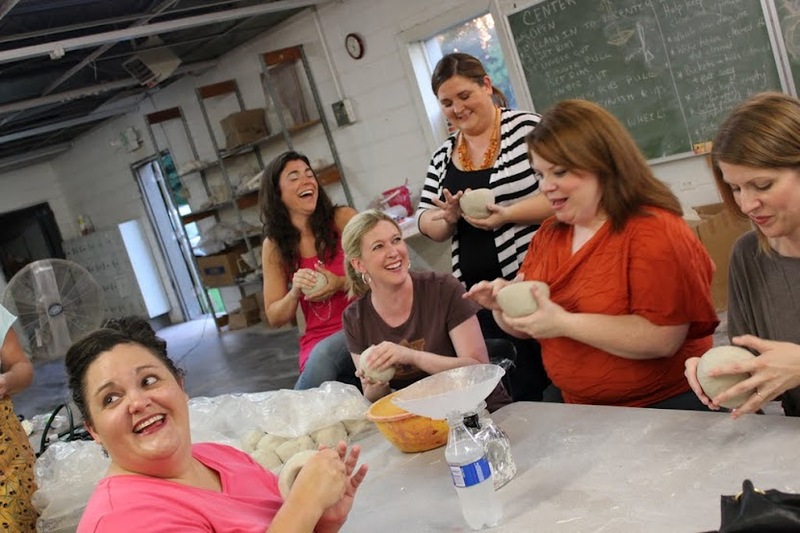 I have never made pottery, but it sure looks like a fun girl's night out. What a beautiful platter! I have never attempted to make pottery but after seeing your pictures I think I would like to! It looks like fun and that platter is so beautiful. I have stuff my grown kids made when they were in school and although they are not perfect (the pottery not the kids) I treasure every piece. My mom and I took a class when I was in Jr. High School. We made a sugar bowl and lid and a short vase. I still have the vase. It is now a pencil holder on my desk. It is more than 40 yrs old. My best advise is to do it with someone you love. Make great memories. My mom passed in May at 91 and I still treasure our time. I have never tried it but my brother in law has taken classes at our local college on doing it. You could check your local schools and see if they have any classes you could take. I learned how throw pottery in girl scouts many years ago. Best advice is to keep a steady hand! have never been brave enough to tackle pottery! I admire you for giving it a shot. The plate you're giving away is lovely. Thanks! Love pottery of all kinds! A 'goal' is to learn to make it myself. I tried pottery making at summer camp when I was a kid. Almost everything I made on the wheel blew up in the kiln. The things I made from molds were fine, but not nearly as much fun. Also, I LOVE Southern pottery. I am a Southern girl living in the Southwest, and I have a whole wall dedicated to Southern pottery - Buck Run, Follette, Mud Daubbers, Peter's Pottery, I love it all! I have made bowls out of play-doh with my kids. Does that count? :) A Girl's Night Out there sounds so fun! So cool. 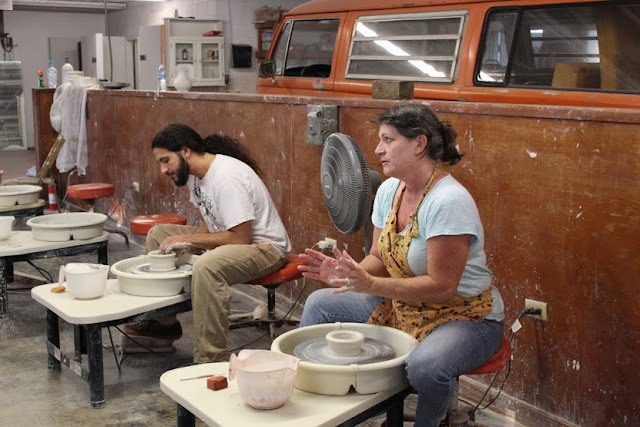 I've never tried a pottery class before but is sounds fun! Just have fun! Any imperfections will only make your pottery more unique and special! Sounds like a fun night with the girls! I've never made pottery, but I'd love to try! The piece you're giving away is fantastic. Love your blog (we eat lots of your recipes at our house....especially the tailgating food!) and love that your husband is called Chicken Legs....so cute! Sounds like fun! I took a pottery class in college and had a lot of fun with it. Unfortunately, I didn't keep up with it. My tip for you would be, if you enjoy it, stick with it and just have fun! I haven't tried to make pottery, but I would absolutely love to. I love pottery and admire anyone that makes and paints it. I'd love to have a kitchen full of pottery. The giveaway piece is gah-jus! I've never tried it, but really want to. It seems like so much fun. The closest I have come to making pottery is helping my daughter set up those cheap plastic toy pottery spinners! wow! gorgeous. I have never made pottery or even tried. Looks like fun though. Thanks for the opportunity. I haven't ever tried to make pottery but after reading your post & finding out where they are located I just might be giving it a try=) It's not far from me at all and looks like fun! The only advice I would have is to relax & enjoy creating! Thanks bunches for a chance, I'd LOVE the Earthborn platter! I have never done any pottery but it does look like fun! Thanks for sharing. Too bad I don't live closer. I'd love to learn more. I've always wanted to do this, but of course there is never enough time or money! I've tried making pottery once...it was a disaster! Not unlike our Tigers' football season :( I'm sure an Earthborn Pottery platter filled with seasoned olive oil and good loaf of crusty, chewy bread would make it all better, right?! I have not tried pottery yet, but it is on my list to start next month! How serendipitous that I found this blogpost. Yes, this last spring I started pottery classes after getting a taste of it with an onboard pottery class on a cruise. LOVE it! And it IS so much harder than I thought it would be... that clay and I fight every time (and I'm not always the victor!). The tray you are giving away is beautiful! I have dabbled in ceramics but never made pottery! This is beautiful! there's a new little pottery studio close to where i live, and it's definitely high on my list of "things to try"... i took a ceramics class in college but didn't commit to it 100% and i totally regret it! this looked like SO MUCH FUN! I've tried making ceramics in an art class but we never used the wheel...sounds like fun! I make pottery! It's my therapy! Probably just as expensive as sitting on a crunch, but I love it! Wheel, kiln and all that stuff! I LOVE pottery! I have never tried making pottery. Didn't everyone want to try it after the movie "Ghost" came out? The platter is gorgeous. I took ceramics in high school as my "art" class. Made several "pinch" method items I still have today. I was always amazed when the things came out of the kiln after glazing, they looked so different. Thanks for bringing back those memories. Made pottery in college but that was 20 years ago. Love this pottery!!! No I have never tried pottery. I would suggest keep at it and your imagination will help you make amazing things! I've never attempted to make pottery (unless you count when I had my Cub Scout pack make bowls for Mothers' Day). I've been wanting to take a local class. The platter is beautiful! I am so glad to know about this place. I would love to try my hand at pottery. Thanks for the chance to win this beautiful piece. I have never made pottery before! It is such a beautiful piece! It looks like you had a really fun day getting to meet your fellow foodie bloggers. The pottery is beautifully glazed and I can see how it was special enough to catch the eye of the Food Network stylists. It is generous of you to share your two pieces and have this give away. All I know about making pottery I learned from the movie Ghost. Enjoy the new hobby! I used to make pottery. Well, I made poured pottery, items. I made a dog once and my landlady got mad, saying I hadn't paid a pet deposit!! Does play dough as a kid count? I didn't know Earthborn existed. Will have to make a date with my BFF for a girls night!! I took pottery classes in both highschool and college. While I enjoyed it, I don't think I was very skilled at it. My tip is to try your best. I have never made pottery, but have always wanted to. That platter is absolutely gorgeous! The only pottery I've ever made was when I was a kid with "local mud.". I painted it with food coloring and set up a booth by the road similar to a lemonade stand. Didn't sell a single piece. Oh Lord, that brings back memories. I took pottery in high school. The teacher would turn out bowl after bowl. When my turn came it was all lopsided. Finally one of my classmates took pity on me and when the teacher wasn't looking, made a passable pot so I could get out of the class. It's a LOT harder than it looks! Well its on my bucket list of things to do. Looks like a lot of fun. I tried making a pot once during a class in college. The poor thing turned out so lopsided, that I ended up using it for paperclips. I had a lot of fun trying though, and that's what counts. I'd do it again in a split second! Only attempted once in a little pottery class while on vacation. Didn't do very well at it...so no tips. I've wanted to try throwing clay and have thought about taking my teenagers to this place to try it. Looks like a lot of fun! I've never tried, although I seriously thought about it after seeing "Ghost"! That's a beautiful platter, by the way. Never done pottery, unless playdoh counts! ;) looks like a lot of fun to learn though. The platter is gorgeous! I've made pottery before and would love to someday have a wheel of my own. i did some pottery in high school, but it wasn't very pretty!! I've never done pottery. My kids have though and they've made some very neat things! I've done ceramics but would love the chance to do this! I have never taken a pottery class, but my boys did in high school and I was super jealous! The only words of wisdom I can impart would be, "Practice makes everything better!" I was fortunate enough to be involved in all types of goodies when growing up, pottery being one of them, and I dearly loved it! I had no idea we had this wonderful place this close to us! I'll definitely have to check it out. The class sounds heavenly! Gorgeous bowl, too! 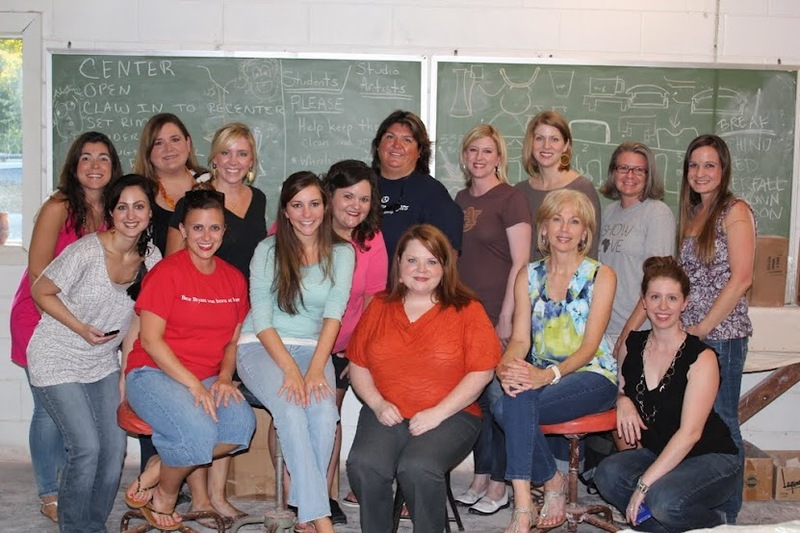 Thanks to you and Cahaba Clayworks and Earthborn Studio for a fabulous prize! I've never tried but it looks fun! I've tried making pottery in a class before and wasn't that great at it but had fun! I was surprised how hard it really is and how much skill it requires. Keep your fingers really wet and take your time! Also think through your colors because they change the look...you may make a neat piece but regret your paint job! Thanks for the giveaway! I've never made pottery before but I live near Leeds and drive by this place all the time, maybe I should check it out! I love pottery, it is so unique and original. I have never made pottery but my Brother has and He always would make stuff for me. Sounds like you ladies had way too much fun. I loved making pottery when I was younger. The plate you are giving away is beautiful! I've never attempted my own pottery before but I've always wanted to do that! Seems like it would be a lot of fun. Super fun! It's been years since I did pottery. All remember is to not let the clay get dry. I've attempted but found I'm not so talented that way. I've never made pottery before but it looks like fun! I would love to try one day. I have never made any pottery...but it is definitley on my to do list! Love Tena Payne's work! I haven't tried pottery, but I'd love to do a girl's night there. I have never tried to make any pottery but it looks like a lot of fun!! I simply adore handmade earthware, although I've never made it myself. It looks like you had SO MUCH FUN!!! What a great girls night out event this would be. Will have to find a local pottery place and check it out. Would LOVE to win this piece! Thanks for sharing with us! I love that piece! I have never attempted to make pottery but I assume that if I tried, I would need a lot of help as well! It looks tough! Thanks for the chance at the give a way!! Oh, how fun! It sounds like you really enjoyed your time there. Would love to own a little piece of the "history"
What a beautiful platter! I haven't thrown pottery since high school, but it is the most relaxing, therapeutic way to relieve stress! The only tip I have is not to worry so much about perfection, and let your hands relax. Also, as with many things, practice makes perfect! I took a pottery class one summer in high school. Even though I wasn't the best or most artistic student, I had a really fun time and by the end managed to produce some nice pieces...well, nice for me :) The only advice I can give is have fun. Everyone gets better at things with practice, but I think enjoying yourself and having fun is the key. I've never taken a pottery class but it looks super fun! About the closest I've been to making pottery was at a 5 year old birthday party at the Arts Center here in Anderson SC. I did try pottery once! What an experience. I was going for a vase and it ended up being a bit lopsided so I made it into a fish vase. Weird but I was so proud of it. I believe I was 13 at the time. I have not ever tried pottery but would love to. It looks like it would be quite fun. I tried making pottery once, but the bowl turned into a plate. Sounds like fun though! I did make a vase in high school. It was alot of fun. My favorite part was painting it. Thank you so much for the giveaway!! I've never tried to make pottery. I have done ceramics. Looks like a lovely piece of pottery. Thanks to you all for the giveaway and the opportunity to participate. Yes, I've tried pottery before. As I was painting it, my teacher told me to hold my breath and my hand would be much steadier. I have never tried it but my daughter has done it several times and loves it but unfortunately, I have no tips for you other than enjoy and have fun!! I did try to make a bowl once but kept spinning the wheel to fast. Only thing I would say is if you love it you'll have fun.